The baby brother of the infamous Aegis boys. Does the Aegis mini prove to be the tough chip off the old block or has it still got a lot of growing up to do? The aegis series from Geekvape is probably one of the most well known mods on the market, bringing an almost indestructible mod that functions perfectly well on top of that. 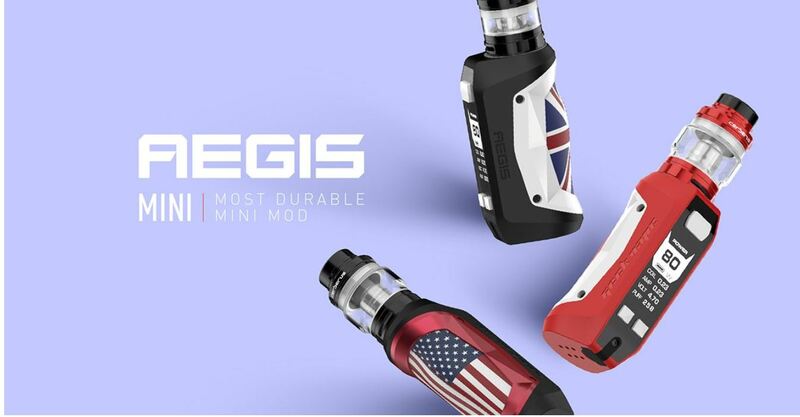 Geekvape have come back with the Aegis mini, aimed to bring the same durability and toughness but in a much smaller form. 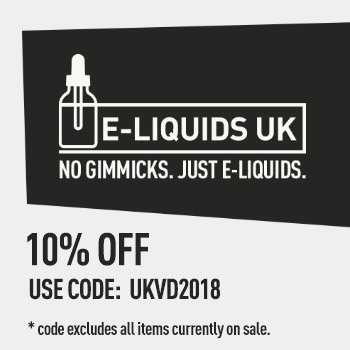 It is a very interesting idea that Geekvape have ran with, but is the kit well worth taking notice of or have Geekvape brought out something that is still in its infancy? Before we get into that, let’s go through the details first. 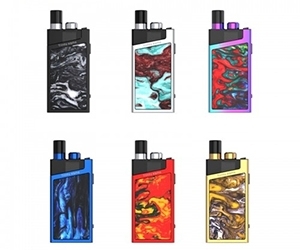 The aegis mini is a 2200 mah internal battery device capable of firing as high as 80w. It comes in a rounded design with a 510 spring loaded pin top and large metal plate on top. The body is rubber on top of the silicon, leather and alloy to provide unbeatable durability compared to other devices. The 2200 mah battery is charged via usb and is compatible with 2A fast charging going from empty to 80% in only 30 minutes. The Aegis mini has small fire button positioned above the screen and two navigation buttons placed underneath. The device has a large black and white screen displaying the usual watt, volt, amp and battery indicators. 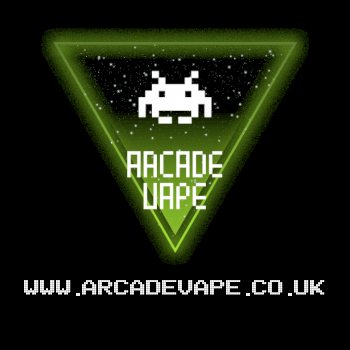 3 clicks of the fire button takes you into the simple Geekvape menu system, with everything controlled on screen. Using the navigation buttons you can change between power, TCI-NI, TC-SS, TC-TI, TC-TCR, VPC and Bypass. Holding the fire button chooses the selection and locks it back into place ready for vaping. The aegis mini boasts not only durability but shock proof, dust proof and fireproof protections to the device as well. Finally the USB charging port is located on the bottom of the device covered with a rubber flap to protect the port. The Cerberus tank is the sub ohm kit tank by Geekvape that is commonly found with the Aegis Legend. 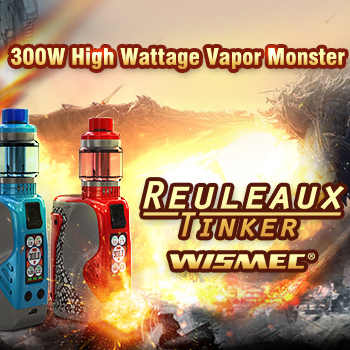 It is a sub ohm tank with a multitude of coils available ranging from low to high powered. 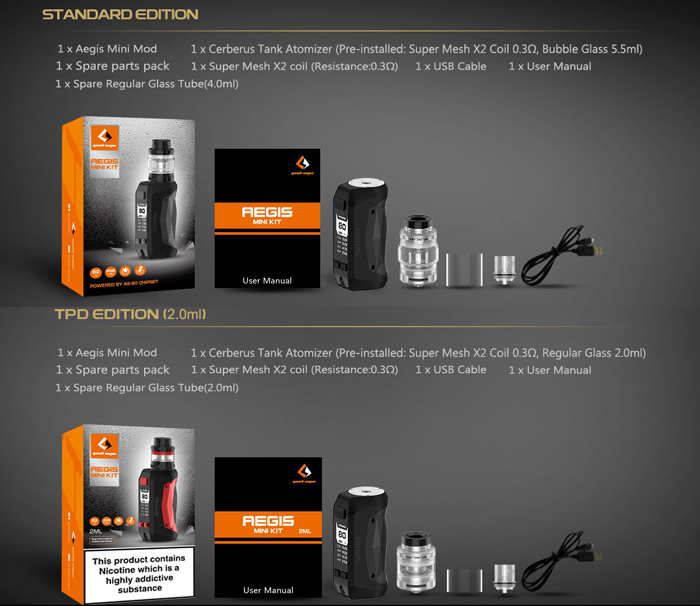 The aegis mini comes packaged with two low powered coils, designed for the lower power of the mod itself. The coils are rated 0.3 and are single and dual mesh respectfully. The tank is a 5.5 mil glass (2mil TPD) with a top replaceable 810 drip tip and bottom adjustable airflow. The tank has a screw off top fill method revealing a kidney shaped fill hole underneath. It is a 25mm tank with 510 threading and colour matched with the Aegis mini depending on the kit it comes with. The Aegis mini is a strange little device, almost to the point that until you hold it, you never believe how small it really is. Compared to the Aegis legend, this device is tiny and that is what makes it such a nice little mod, which will be the first pro of the list. Despite the heavy duty reputation, the Aegis mini is both small and lightweight, and very comfortable to hold. On the leather far side are almost finger indents for holding and the whole thing in general feels quality and well made. Another great thing I love about this device is the menu system and the simplicity of it all. Very much the AS chip set that Geekvape are known for, it is both simple to operate and very simple to set how you want to vape. It even comes with a navigation button lock by pressing the two buttons in place which is another nice addition, especially with the screen time out to save battery. The durability of the device is always going to be a major pro whenever you are talking about the Aegis range and this device does not disappoint in that respect. I have accidentally dropped the mod a couple of times and the device has come through unscathed. So the perfect work mod as it were, something you don’t have to worry about breaking or bulking up your pocket. The Quick charge is another great feature, charging through a usb port the device went from 1 bar to full in about 60 minutes, which is fantastic. The perfect device for me to take to work and charge knowing it will be full well before lunch. The Cerberus tank with the low powered mesh is a lovely addition to the kit. 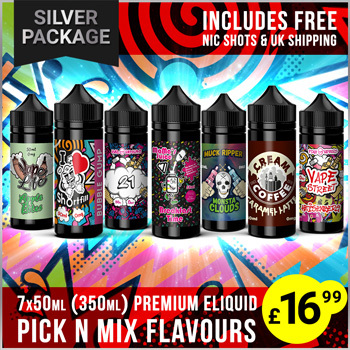 The coils give off great flavour and vapour production at only around 40w and combined with the battery watt limit, means the mod will last you all day before you need to recharge. I love the top fill on the tank, very easy to twist and lift off, very easy and convenient for filling on the go. The 5.5 mil capacity out of the box is another great addition as always, plenty of liquid capacity to keep you going for a while. For the Aegis mini itself, there is very little cons I can really say about the device. For what it is designed to be, it works really well and seems very well designed prior to release. One con that would be superficial is that the battery is not bigger. If you are chain vaping with this device or running it at the full 80w then you aren’t going to get the best life out of it. However as a portable mini version of the main range, it is almost perfect in that regard. I guess a personal preference would have been a front facing screen with fire on the side, simply to make the most of the finger groove design on the opposite side. As it stands to use them you fire with the button in your palm which doesn’t feel natural. The Cerberus coils I did find to be a little hit and miss when it came to wicking and flavour retention in all honesty. They perform well but if the tank is low or tipped up, I did find the cotton then struggled a bit to keep up with chain vaping, which produced small dry hits as a result. I also found it seemed to keep the old flavour in it a bit too much which meant I had to move between a couple of tanks for the new flavour to really take over. So when the tank performs it is a lovely vape but the low powered coils did struggle a little bit, especially when it came to wicking. 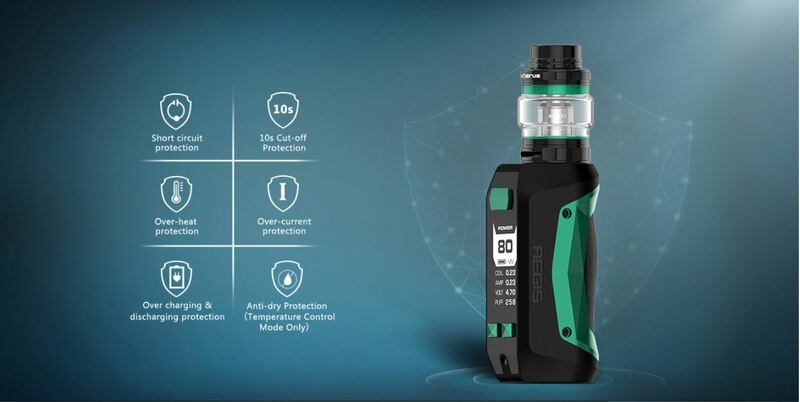 For what it tries to be, Geekvape have got the Aegis mini spot on pretty much for a internal battery, portable and most importantly well performing device. The device feels so well made and it almost eliminates some of the complaints that the legend version carried in terms of bulk and weight. The trade off is in the battery life but for such a quick charging battery, it almost doesn’t matter that the battery only comes in at 2200 mah. 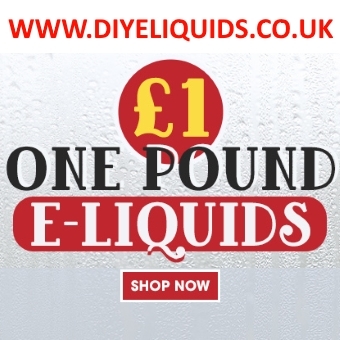 I have said it before but you really have to hold it in your hand before you truly believe how small this device is and I can see this being a very big hit with vapers today. It has fast became a very convenient carry mod for me and the AS chip performs fantastic with quick firing and accurate temperature control to give a very satisfying performance. The baby brother has learnt a lot from its siblings and the Aegis mini is small, but certainly a force to be reckoned with. The Aegis mini is perfectly designed to offer performance, comfort and durability all rolled into a nice tiny little package. A perfect little device that does not disappoint. 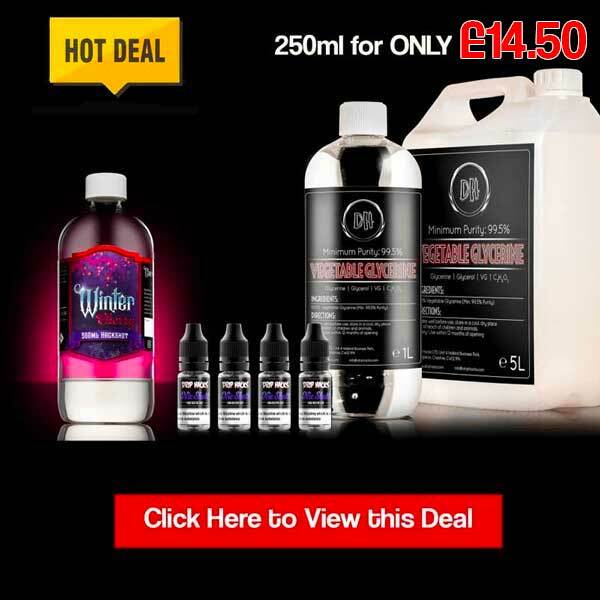 With the multitude of colour options and price point, it is very much worth your money.